Google Pixel 3 hands-on hands on review | What Hi-Fi? Having already delivered the early verdict on Google's new Home Hub and Slate, we turn our attention towards the company's eagerly anticipated phone, the Pixel 3. Available in standard and XL sizes, the Pixel 3 is essentially the Android answer to Apple's iPhone XS, at a much more affordable price. 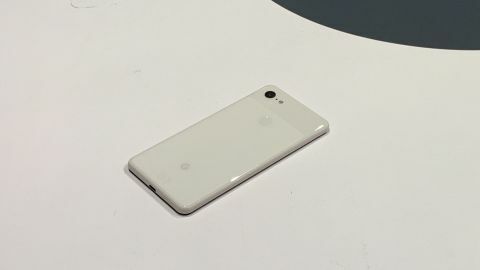 Where the Pixel 2 used a metal and glass combination for its back panel, the Pixel 3 has a single piece of glass with a matte finish and gloss at the top. In that glossy top section you'll find a single-lens camera with a small flash to the right. The fingerprint sensor and small Google logo are respectively placed near the top and bottom of the matte section. The chassis is almost identical in size to that of the Pixel 2, but on its front you'll find a significantly bigger screen. It's 0.5in bigger, to be precise, which may not sound like a lot, but that equates to a 10per cent increase over the 5in display of before. That screen runs to the left, right and top edges, with a notch along the top similar to that of the iPhone XS. Unlike the iPhone XS, the Pixel 3 has a bit of a bezel along the bottom of its screen. This is so both speakers can fire forwards - the iPhone's bottom speaker is relocated to the edge. The Pixel 3 is a touch taller, narrower and thicker than the iPhone XS, but both phones are more manageable than their pumped-up siblings, and for many will prove the perfect ratio of chassis-to-screen. Where Apple takes itself seriously when it comes to colours, Google has seemingly had a dig at its arch rival, calling the three different finishes Just Black, Clearly White and Not Pink. That latter finish is pink. But it's very pale, and almost white in the right light. The white and pink phones have power buttons in strongly contrasting colours – green for the former, orange for the latter. Combined with the more rounded corners, the finishes inject a bit of fun into the design. But it’s the 5.5in OLED display we’re most excited about. Compared to the XL model, the standard-sized Pixel 3 screen's resolution has dropped proportionally, meaning it has a lower pixel density – 443ppi compared to the XL's 522ppi. It also has a slightly lower pixel density than the 458ppi iPhone XS, which might sound disappointing, but at this size we wouldn't expect the differences to be obvious. At the hands-on event it was impossible to draw any firm conclusions, but the Pixel 3 screen looks sharp, detailed and punchy in its own right. If screen quality is hard to judge at a hands-on event, sound quality is more or less impossible. Google claims the speakers are 40 per cent louder and richer than those of the Pixel 2 – the fact we could hear them at all suggests the extra loudness claim could be true. As for added richness, there was simply no way of telling in the crowded room. Of course, you shouldn't rely on your phone's speakers, so it's a relief that, unlike the Pixel 2, the Pixel 3 comes bundled with a pair of headphones. They essentially look like a wired, USB-C (the Pixel 2 doesn't have a headphone socket) version of the company's existing Pixel Buds. Hopefully they'll sound better – we don't rate the wireless Pixel Buds very highly. One of the big draws of Google's own Pixel phones is that they come pre-installed with the latest and cleanest version of Android, and that's once again the case with the Pixel 3, which runs Android 9 'Pie' out of the box. The Pixel 3 even gets some neat exclusive features, such as Active Edge, which allows you to squeeze the phone to invoke the Google Assistant. Under the skin is a Snapdragon 845 processor and 4GB of RAM. That's not an Earth-shattering amount of power for a 2018 phone, but it should prove more than enough. The experience was certainly very slick and fluid during our hands-on. There’s no microSD card slot, so you’re stuck with the 64GB or 128GB of built-in storage. Serial hoarders of music and movie files will be disappointed that there aren't 256GB or 512GB versions of the Pixel 3, as there are of the iPhone XS. The 2915mAh battery isn’t the largest out there, but it should be more than capable of giving you at least a day’s worth of life before needing a charge. And charging can now be done wirelessly, using either Google’s own Pixel Stand, or any other Qi-compatible wireless charger. The Pixel 2 camera is still highly regarded, so any upgrade for the Pixel 3 will be exciting to potential buyers. The improvements are largely software-based, with the 12.2MP snapper being powered by a dedicated Pixel Visual Core, which is said to improve photos through machine learning. It introduces features such as Top Shot, which takes a number of snaps before and after you press the shutter button and automatically selects the best based on factors such as how your subjects look and whether there’s blur or noise. Night Sight, meanwhile, is designed to produce better low-light shots. And we're rather impressed by the front 'selfie' camera, which has a wide angle lens than enables you to capture not just your own mug, but also the people you're with and the scenery around you. The Google Pixel 3 has a 1st November release date and is available to pre-order now. It will cost £739 with 64GB of built-in storage, or £839 for the 128GB version, which makes it significantly more affordable than the iPhone XS (from £999). Despite being quite the step-up in price over the Pixel 2, the degree to which the Pixel 3 undercuts the iPhone XS will make it popular with smartphone buyers. We're disappointed by the lack of high capacity storage options, but that will only be of concern to a small number of potential purchasers. What matters to us most is, as ever, picture and sound quality, and we'll have to wait until our review sample arrives before delivering the definitive verdict on those.